Just 10 minutes north of the Cairns International Airport and 15 minutes from the Cairns City centre, this delightful Cairns Northern Beaches community has everything to offer visitors - safe swimming beaches, restaurants, shopping centre, resort and apartment accommodation, world class marina, 18 hole golf course and really friendly locals. 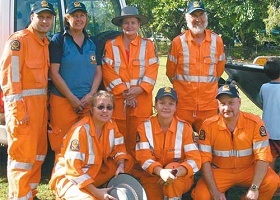 The Yorkey's Knob Residents Association Inc. has been holding the Festival of the Knob on the Queen's Birthday weekend in June since 2005. This year the 14th annual Festival of the Knob will be on Saturday 16th June 2018 from 10:00am to 5:00pm. The festival came into being because on 30 November 2004, a motion was passed at the Association's monthly meeting to lodge an appeal No. 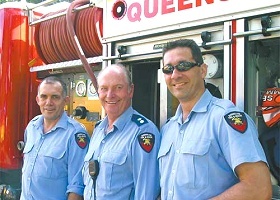 457 of 2004 with the Planning and Environment Court in Cairns against the Cairns City Council and the Toma Group Pty. Ltd. We are pleased to say that the appeal was successful, but after counting our donations against the final outstanding bills, we still owed money. What should we do to pay off our debt, and start up a memorial fund to be built in commemoration of George "Yorkey" Lawson? Have a Festival, of course! 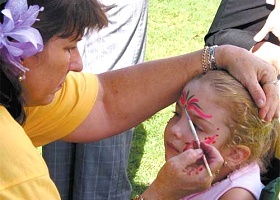 Our Festivals have been so successful, that the Association continues to hold these events annually. The Festival sub-committee usually starts organising things during March/April each year. Volunteers are essential to the smooth running of the Festival and we urge anyone who would like to get involved to contact Yorkey's Knob Residents Association by email at residents@yorkeysknob.com. 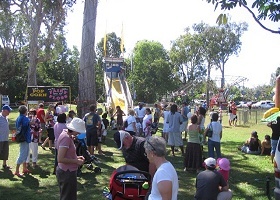 The Festival of the Knob is held at our Community Centre in Wattle Street, in beautiful grounds that are well shaded with plenty of room for live music and entertainers, jumping castles, giant slides, wandering clowns and a special kid's swing set up by the SES. 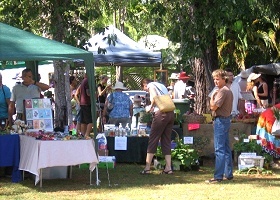 There is always a great variety of stalls including arts and crafts, massage, plants, books and second hand clothes. A variety of food and drinks are on sale. Monster raffles now form part of the attraction to our Festivals, as do our historic displays. The rare feature of these Festivals, is that every business in Yorkey's Knob supports this local event by donating prizes, lollies, chips and drinks. An actor who portrays â€œYorkeyâ€� is driven around the grounds in the back of an SES dinghy and throws lollies to the children. This is a great draw card for children of all ages. 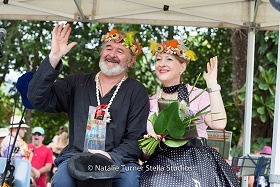 Each year, the residents nominate the King and Queen of the Knob. The unusual feature of their crowns is they are covered in wooden door knobs and surrounded by shells. Pat Morrish from the ABC has opened our Festivals since they began, and being a local resident of Yorkey's Knob, we hope she will continue to do so for many years to come. 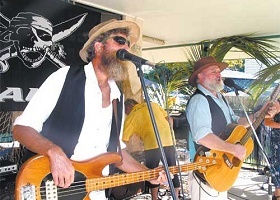 The Festival of the Knob now forms part of our community's yearly events, and as numbers grow each year, it is becoming a positive event throughout Cairns and its districts, bringing many visitors into Yorkey's Knob to enjoy our idyllic beach side living and to celebrate with the locals on this special June weekend. Don't forget, to become involved either as a volunteer, a supporter or as a stall holder please contact us by email residents@yorkeysknob.com. We are calling for anyone out there who would like to volunteer their time to help with organisation and/or any of the jobs involved in getting the 2018 Festival of the Knob up and running. Please contact us via email if you want to join the team. All contributions of time and expertise are welcomed, both large or small. Photos And Web Site By PDIS - Unauthorised copying of images prohibited.